Makers of the Patented BuckStix Vapor Action Deer Scents Deer Lure Dispenser and the Skin-Tite Camo Mask. Civil War Mortar, are actually short barreled Cannon designed to launch large, hollow projectiles at very high elevations using a small charge of powder. 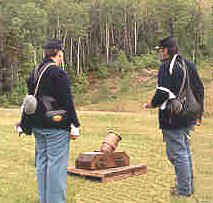 Mortars are smooth bore weapons designed to fire exploding cannon balls with fuses timed to burst above infantry and cavalry. Civil War Mortar, like Howitzer Cannon, were made in various models and sizes. The Largest Mortars such as the 13" Seacoast Mortar below, fired a 200 pound shell over 2-1/2 miles using 20 pounds of black powder. These monsters weighed over 17,000 pounds and were mostly stationary, although a few were made mobile by mounting on railcar platforms or aboard decks of large ships. The Coehorn Mortar Model 1838, which was used by both sides during the Civil War, was named after the Dutch inventor, Baron van Menno Coehoorn (1641-1704). This original "24 pound Coehorn Mortar" had a bronze tube weighing 164 pounds and was mounted on a wooden Mortar "Bed" weighing an additional 131 pounds. 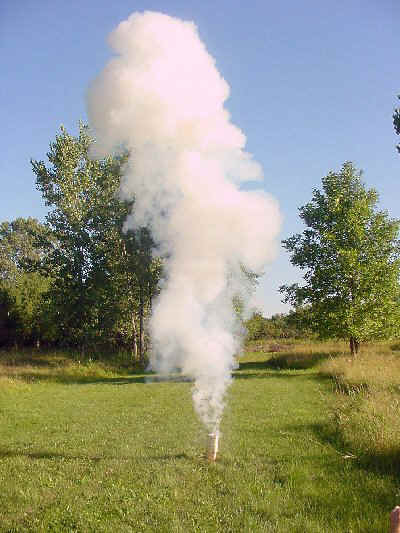 It fired a 24-pounder shell (weight 16.8 pounds) using 1/2 pounds of black powder to a maximum range of 1,200 yards. This 295 pound weapon had 2 handles on each side of the Bed to accommodate a standard crew of 4 men to carry it into battle. This was an arduous task even for 4 men. The lightest Civil War Mortar, a Bronze "12 pound Coehorn Mortar", had a 75 pound tube on a 70 pound Oak Bed and weighed only 145 pounds. This platform was very maneuverable and easily handled by a crew of only 2 men. 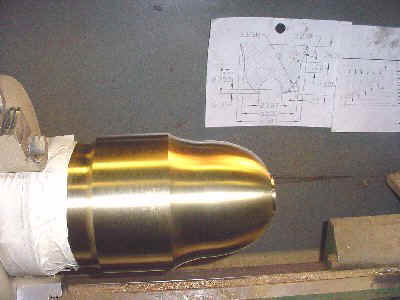 The 12 pound Coehorn Mortar fired a 12-pounder shell (weight 10.2 pounds) and used only 1/4 pound of black powder to propel its shell to an equal maximum range of 1,200 yards. So why build a Coehorn Mortar? Well, I liked the idea of a small Mortar that was easy for 2 people to handle and could even be 'horsed around' by ones-self if necessary. And, since I already had a 12 pound Mountain Howitzer, the smallest of the Civil War Cannon, I figured it would be appropriate to have a 12 pound Coehorn Mortar, the smallest of the Civil War Mortars. Also, an added benefit was that I could use the exact same projectile in both Artillery pieces. 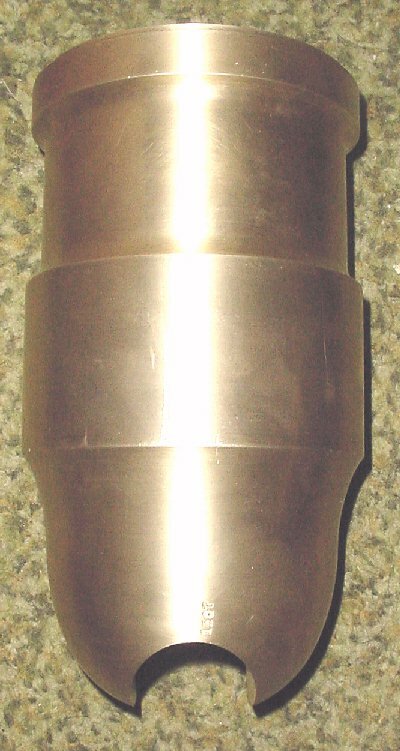 Coehorn Mortar Tubes are available from several makers through the U.S. 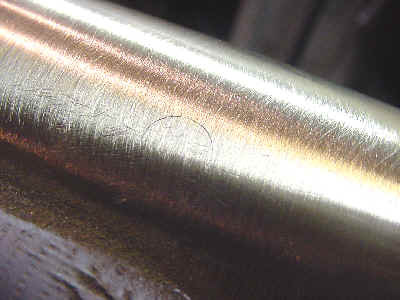 Tubes are available in Bronze, Steel, Cast Iron, and Cast Iron with steel liner. They range in price from about $400 for the Cast Iron tubes all the way up to $4000 for cast Bronze. Although there were commercial barrels to choose from, once again, I decided to engineer and build my own Coehorn Mortar Tube; not only for cost savings, but also for strength. 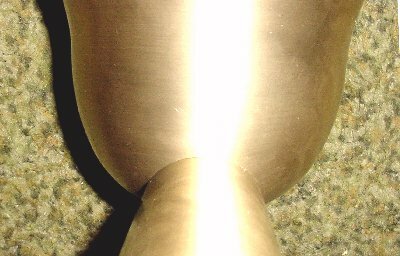 Bronze, Brass, and Steel material was readily available and so was the equipment I needed to build it. 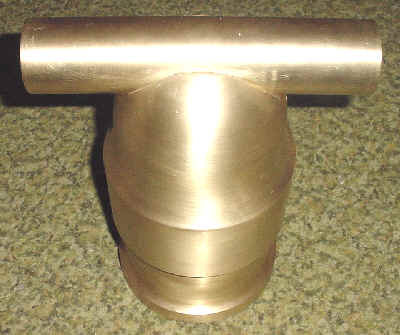 The Coehorn Mortar that I designed consisted of 2 pieces. 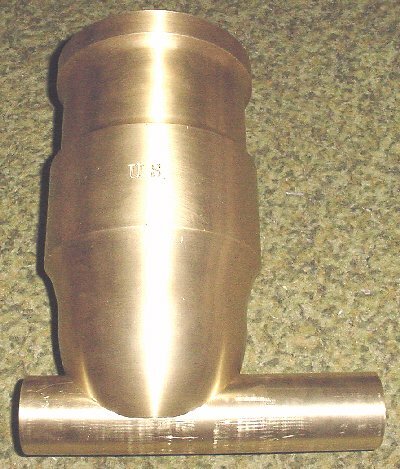 The " Tube " ( barrel ) and the " Trunnion " ( the support pivot at the rear of the Tube ) As you can see, when the two pieces are assembled, they complete the Coehorn Mortar Tube. 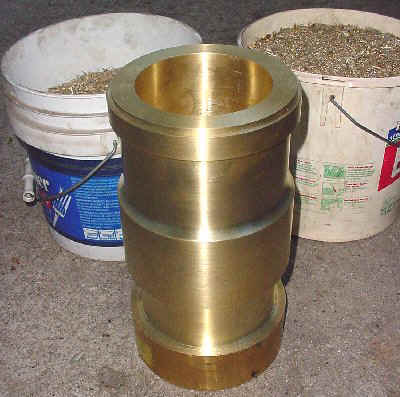 The Mortar Tube material purchased was a solid piece of Cast & Turned C360 Brass that was 6-1/2" in diameter, 12-1/8" long, and weighed 120 pounds. 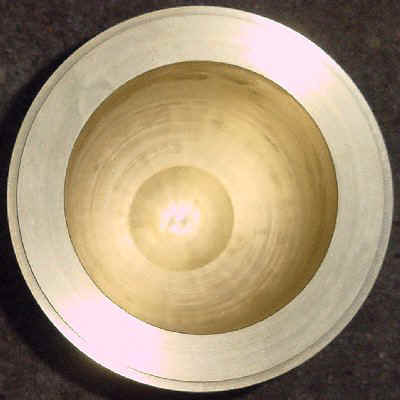 Although a 7" diameter would have been optimum to obtain a finished overall diameter of 6.7", the slight reduction of 0.20" in the Outside Diameter (O.D.) of the rings would hardly be noticed. The wall thickness remained the same. 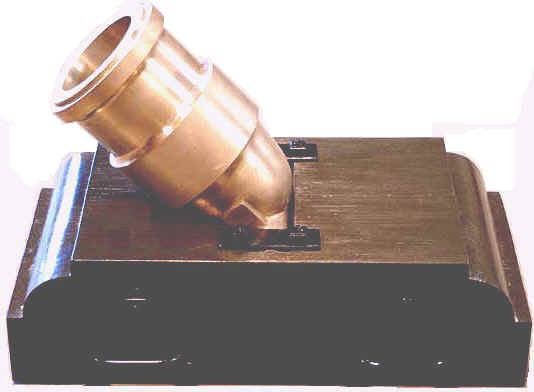 By purchasing 6.5" stock, instead of 7" stock, we saved machining time, material cost, and considerable shipping expense because the added weight of the 7" bar at 160 pounds would have required special trucking. Also, over 30 pounds of that additional material would have been needlessly machined-away as scrap. 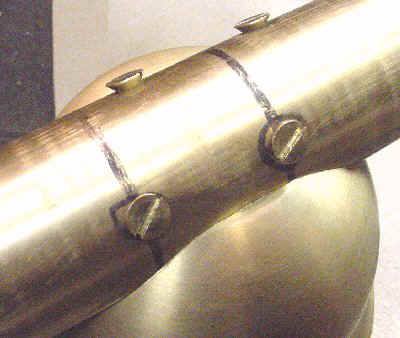 Like the Mortar Tube material, the Trunnion bar was also C360 Brass. It was 2-1/4" diameter, 10" long, and weighed 12 pounds. The two would be "mechanically" joined together in a most ingenious and creative design that did not compromise strength and was still easy to fabricate. 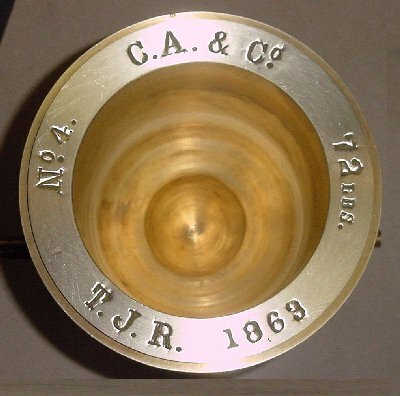 Note: Although the "Bore" of our Coehorn Mortar was exact per 1838 size, the inside Powder-Chamber at the bottom of the bore was reduced by 25% from the original. This 25% smaller chamber size takes into account that our modern black powder charges are not going to be as bulky as the original 1838's powder charges, and that modern black powder is much more efficient than that of 165 years ago. 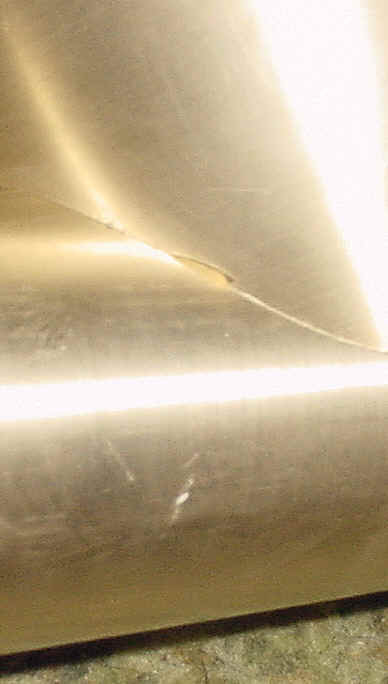 In addition, the reduced Chamber size resulted in an increase in wall thickness in this area of the Coehorn Mortar. Our reduced chamber would hold approximately 1/5 pound of modern black powder ( 1,400 grains ) as compared to the original 1/4 pound (1,700 grains ) of the antique chamber. In addition, since we're not going into battle, there is no need for maximum powder charges to be used. 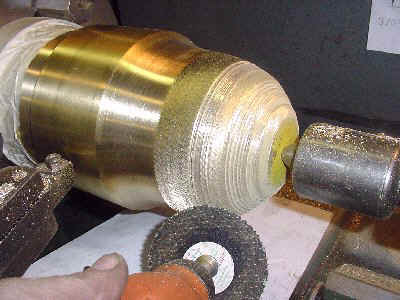 As was the case with my Mountain Howitzer Cannon project, the same friend offered the use of his large metal lathe for my Coehorn Mortar project. 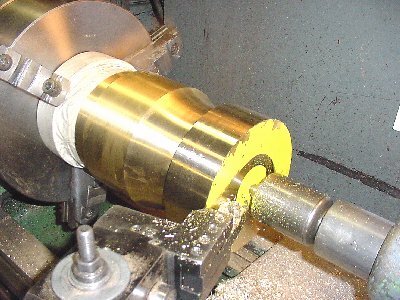 His 13" LaBlond lathe was somewhat over-kill for this project, but it allowed us to chuck the 120 pound, 6-1/2" diameter brass bar in the 3-jaw chuck, and machine the bore and chamber from one end. 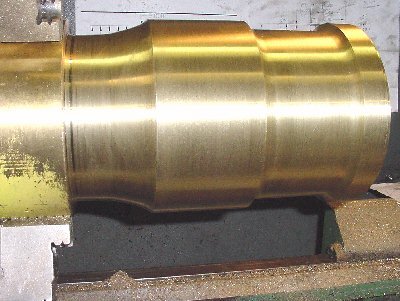 The straight sides of the Mortar's inside bore was machined using an 8" long boring bar. 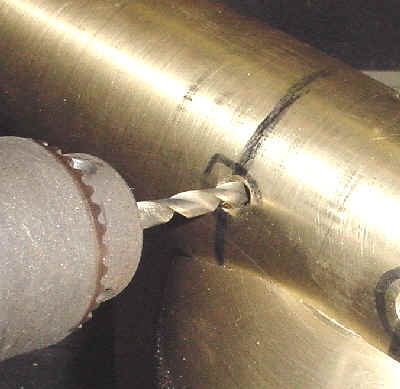 A 3/4" diameter hole was first drilled in the center for tool relief. This operation resulted in over 20 pounds of shavings. 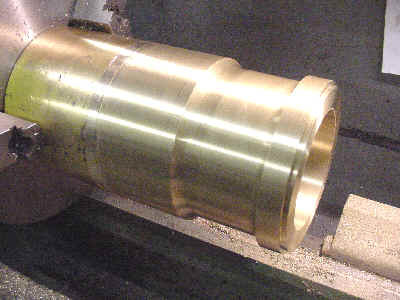 To machine the curved half-round bottom I made a special boring bar with a 2-1/4" radius end. 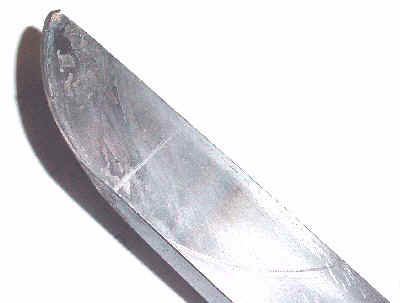 This tool was made by purchasing a piece of cold rolled steel flat bar measuring 5/8" x 1" x 10" long. 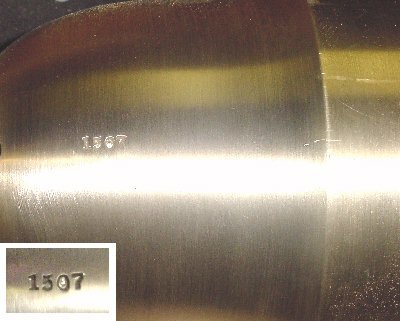 A 4-1/2" diameter circle was scribed onto the end of the bar and ground to shape. The edge was sharpened, and then hardened by heating the end red hot and plunging it into water. 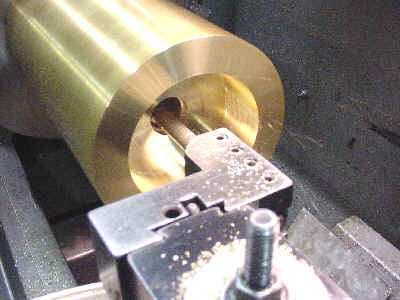 This heating - quenching process was repeated a second time and the result was hard cutting edge that cut through the brass with ease. 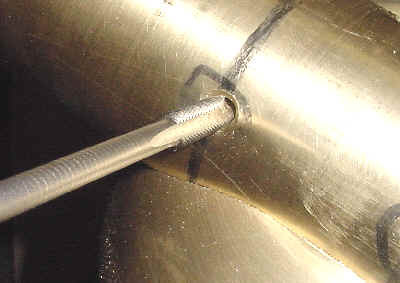 The tip of this same hand-made tool was used to form the powder chamber at the bottom of the bore. The radius of the tool provided a nice cone-shaped chamber, 1-3/4" deep. 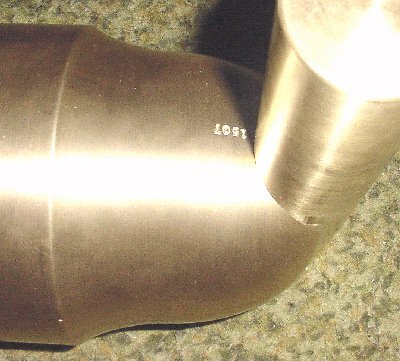 After the inside of the tube was completely machined, the outside of the tube was machined and shaped per print. Only the last 2-3/4" held in the chuck jaws needed to be shaped. 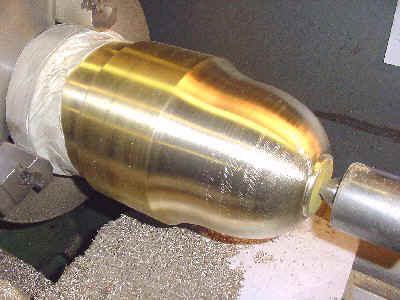 With a starting weight of the Brass Bar at 120 pounds, we had an 80% completed Coehorn Mortar that weighed 75 pounds, and 45 pounds of c360 brass shavings. Hopefully I can get back a few dollars at the scrap yard for this material. 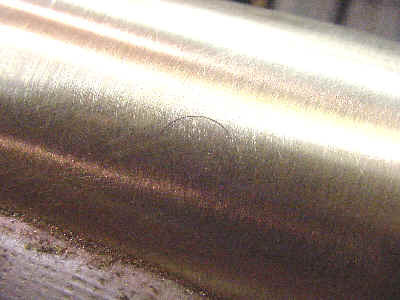 The Brass tube was flipped end-for-end and inserted back into the lathe. 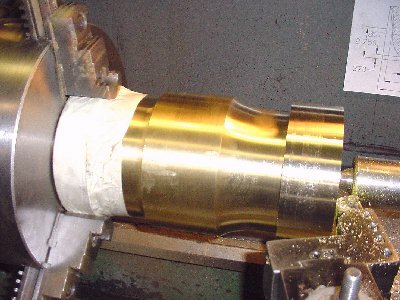 Before clamping the Muzzle ring in the 3-jaw chuck it was banded with a 1 inch wide strip of copper shim stock that was held in place with 2 wraps of masking tape. 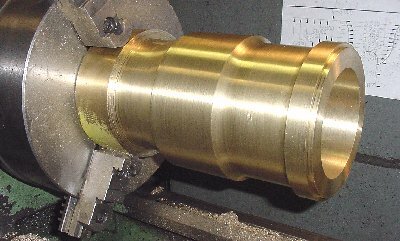 The copper prevented the lathe chuck jaws from marking the recently finished and polished muzzle ring. In addition, in order to prevent excessive load on the muzzle ring, we added a small 1/2" deep center hole and supported the bottom end with a live center. 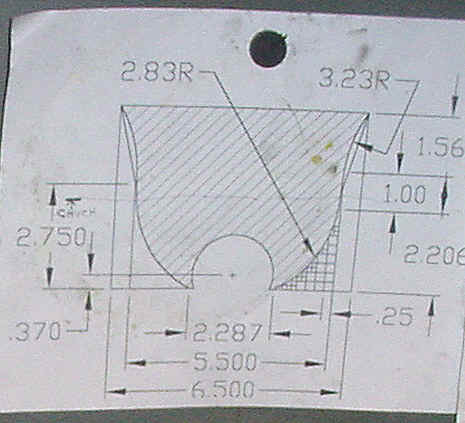 By following one of the blueprints that I made, I machined a series small steps to roughly define the bottom contour. 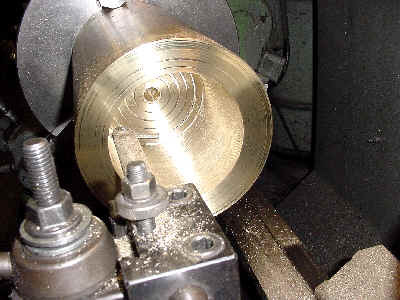 With the piece rotating in the lathe, an air grinder with a cut-off wheel was used to blend all the machined steps. Working the side of the wheel back and forth did a nice job of blending the surface into a smooth curve. 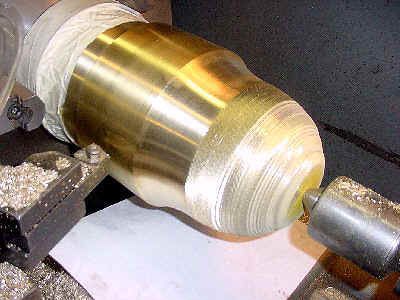 After 30 minutes of sanding, and another 30 minutes of polishing, we had a 100% complete Coehorn Mortar Tube. Finished weight was 63 pounds. 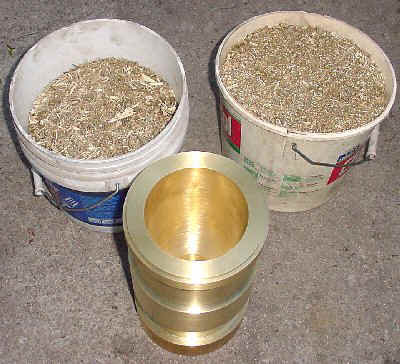 Brass shavings up to 57 pounds. Since the tube was done, it was time to test fire it. A piece of 2x6 was placed on the ground and the mortar tube was carefully balanced on the small 2-1/4" flat on its bottom. The load used was 1,100 grains of FFFFg with a regulation softball. It passed the test. Softball whereabouts, unknown. At this point, I decided to take the mortar tube to a local machine shop to have the 2-3/16" diameter "cross-slot" drilled and reamed for the trunnion bar. 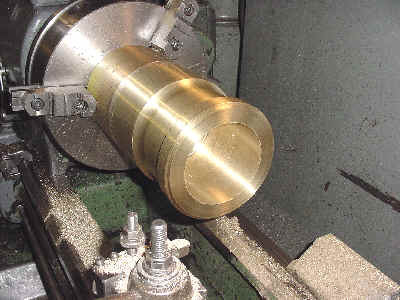 Since this required an "interrupted cut" and a critical, high tolerance operation, I decided a take it to a professional machine shop and pay the added cost for machining services rather than do it myself. CAUTION.... The first machine shop nearly ruined my piece! 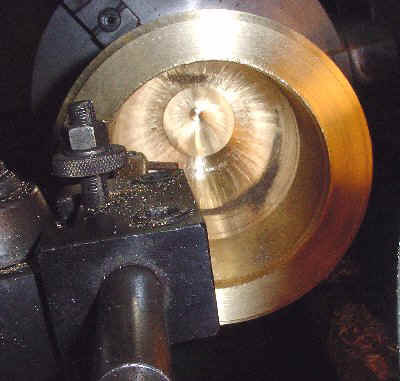 Although this first shop was very experienced in high-tolerance engine rebuilding, they didn't have machines large enough or the required experience for this job. They said "no problem, it will be done in about 2 hours", however, 2 hours later they called explaining that they could not complete the work. Then they said "maybe they could braze up the damaged areas". When I got to the shop, I could hardly breath. It was a real mess. 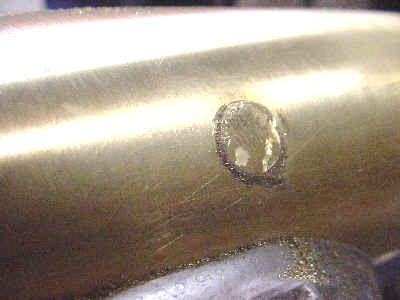 My beautiful piece of brass had major damage from their attempt. It had a rip of a dozen large tool gouges 1/4" deep and 3/4" long and they still charged me $50 for the attempt. I paid and took my piece home. 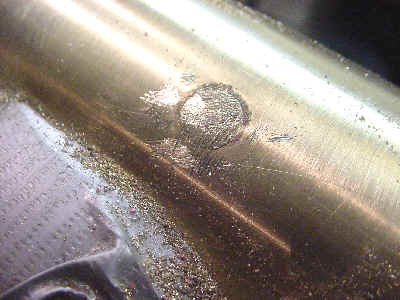 Lesson, make certain that the machine shop you intend to use, can actually do the work. 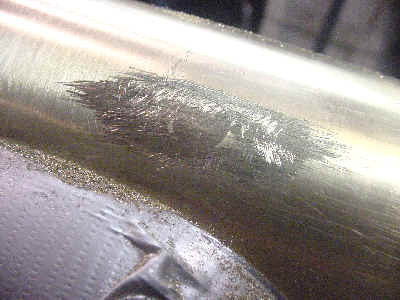 Ask about guarantees if they damage your expensive material. Fortunately for me, my son-in-law came to the rescue. He is a Master Machinist, for a company that has large computer controlled equipment. 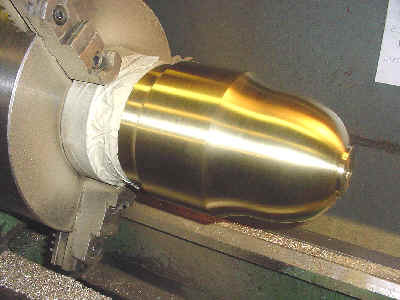 Using a very large computerized milling machine, he was able to precisely machine away 99% of the damaged area. He did this by changing the angle of the cut and machining through the gouged areas. I can't thank him enough for his help. 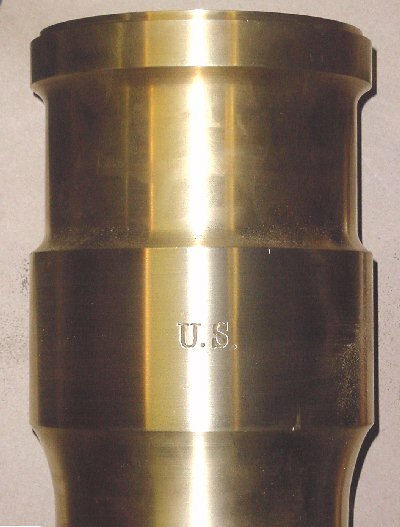 With the 2-3/16" diameter cross slot milled in the bottom of the tube. A 10" long trunnion Bar was machined to fit. 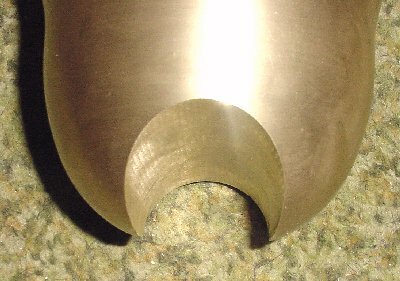 It was given about a one-half thousand taper from each end with a one-half thousand interference fit at the center 3 inch area. Notice that the machined cross slot has its center located slightly above the bottom plane of the tube. This makes for a "captive" slide fit somewhat like a round dovetail. This results in a perfect fit of the bar to the tube. 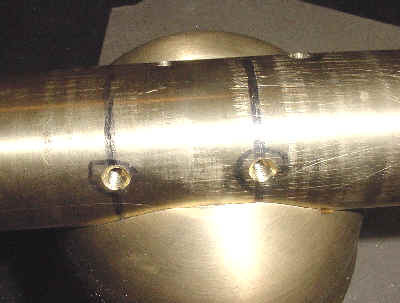 The trunnion bar was hammered into final center position with 15 smacks from a lead hammer. 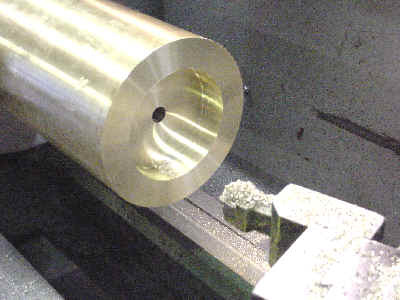 Four holes ( 2 sets of 2) were drilled at opposing 45 degree angles to a depth of 3 inches. 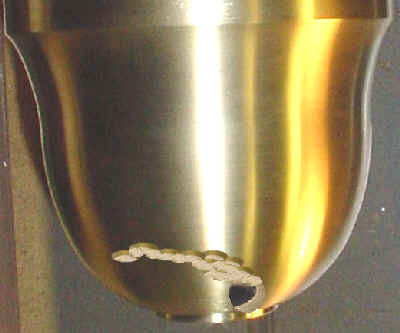 The holes were threaded full length with a "pulley tap" and beveled to an 82 degree taper. 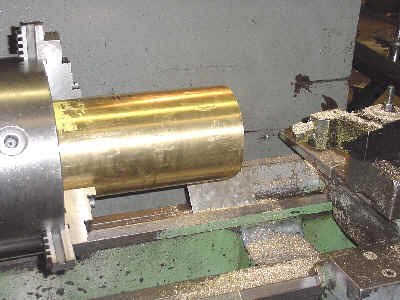 Next, brass flat head machine screws were installed with "red" Loc-Tite. They were threaded in "as hard as could be" using a large screw driver. The assembled Mortar with trunnion was left to dry. After about 30 minutes, each of the screw heads was carefully ground down with a small die grinder, then hand filed with a coarse file, then filed down with a fine file, then sanded down with fine emery paper, and finally polished with a 3M scotch pad. The result was even better than expected. 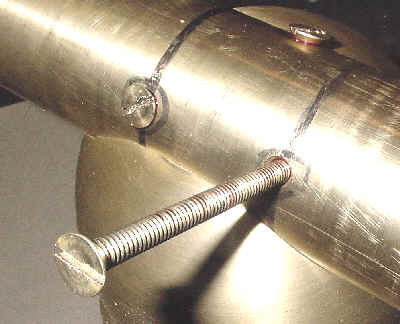 The 4 bolts were nearly invisible and the trunnion looked as though it was cast as part of the Mortar tube. With all the Mortar Tube completed, It was now time to build the Coehorn Civil War Mortar Bed. Send a photo using Buck Stix Deer Scent Deer Lure Dispenser, Buck Lure or Earth Soap to be in our Scrap Book. Based in Oshkosh, Wisconsin, Heart of Whitetail Country, USA. Made in USA.